WordCamp 2007 takes place this weekend in San Francisco. Almost 400 WordPress users and developers from all over the world are coming together for two-days of personal publishing workshops. 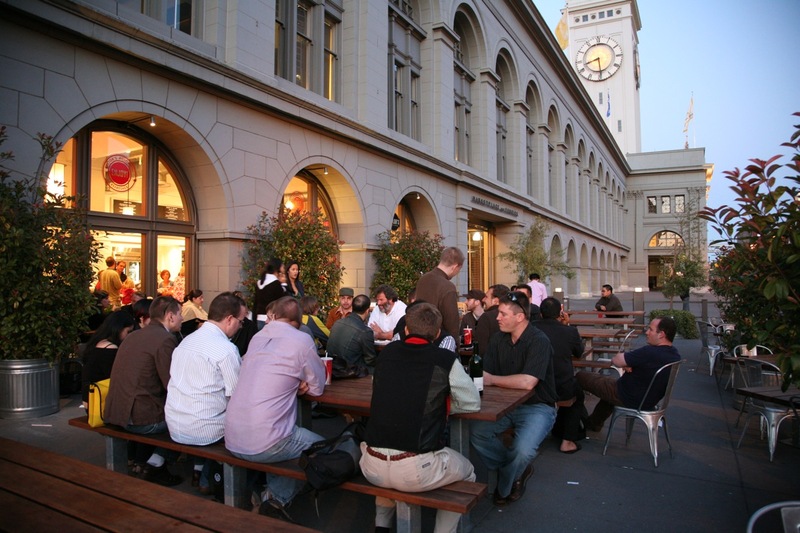 I’m hosting a WordCamp kickoff dinner tomorrow night starting at 6:30 p.m. at Taylor’s Automatic Refresher at the Ferry Building. It’s our second-annual WordCamp kickoff dinner welcoming visitors from out of town with burgers, beer, and blogs along the San Francisco waterfront. Taylor’s Refresher is a small business from the Napa Valley that takes advantage of some of the great food combinations the Bay area has to offer. Each attendee will be able to place individual orders with an expected bill between $10-$15 depending on splurge factors such as sweet potato fries, milkshakes, and beer. We’ll have a sizable group sitting outside at the long picnic tables (pictured above) cooling off after what should be a pretty warm day. BART and Muni trains stop about a block away at the Embarcadero Station.